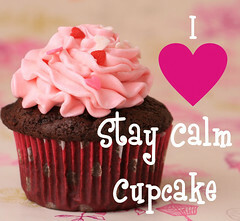 Call Me Cordelia | Stay Calm, Have A Cupcake! Day 2 of the Shop Til You Drop Blog Crawl. Are you having fun yet?! This giveaway is perfect for moms with little princesses. I mean come on, who doesn’t love a sweet little TuTu! Born with an overactive imagination and a passion for sewing, I have always enjoyed creating pretty and feminine items. I started sewing when I was around 10, out of desperation to fix my favorite bean bag doll that had been vigorously loved. I have been hooked ever since.So what inspires me? Ruffles, polka dots and vintage fashion. I am addicted to beautiful fabrics and colorful ribbon. I can never leave a pattern how it is. I must always change something. It’s just how I am. It is so fun and challenging to make it my own. I started my sewing blog, Sew Determined, just a few months ago as a New Year’s challenge to myself to really step up my sewing skills. I also wanted to encourage other time crunched gals like me to take up the art and see how much fun creating can be. One of my other goals I set was to make a complete wardrobe for myself by the end of the year. While on this quest, I decided “Why not share some of these fun outfits with others?” That’s how Call Me Cordelia on Etsy was started. There is something so amazing to wear something that was made just for you by a real person you “kinda” know and not some faceless person in a factory. I just love that about Etsy. It’s a place where super talented people come together and sell amazing things. I am so excited to be participating in this blog crawl giveaway! I am happy to announce that I will be giving away from my Call Me Little Cordelia collection, a fuchsia pink, super fluffy tutu! 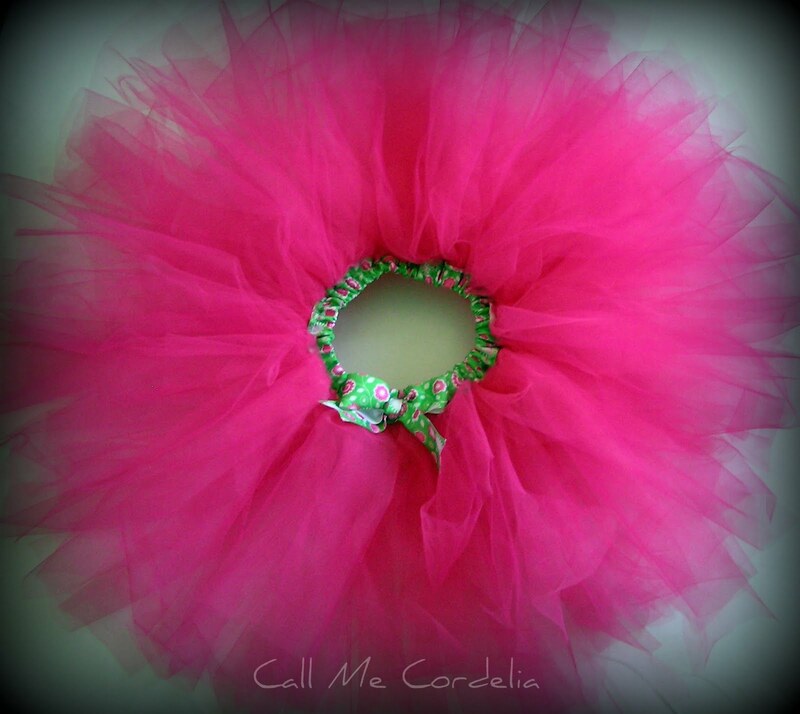 This tutu is sewn, not tied, with yards upon yards of fluffy pink tulle. The waist band is a cute pink and green grosgrain ribbon with 1” wide elastic encased within for a no-itch waist. Playtime should be fun, not itchy and uncomfortable. 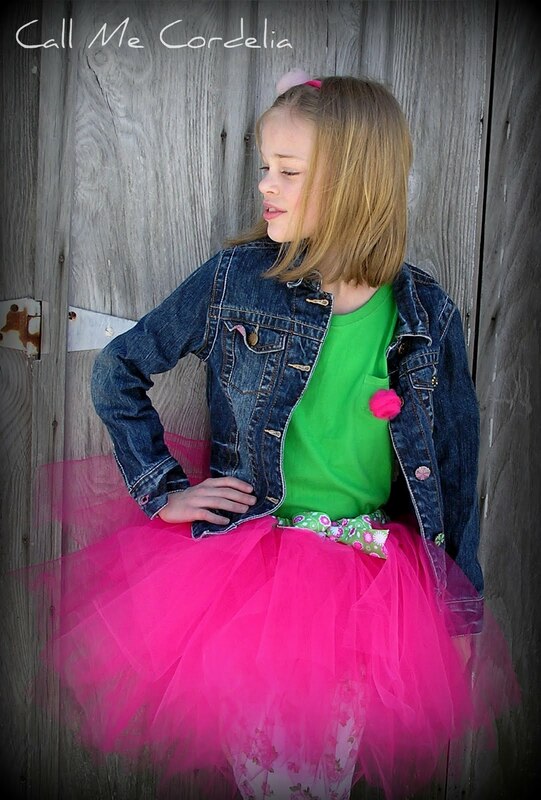 This tutu has a waistband that measures 20 inches with a stretch up to 24” and is 14″ in length. Good luck and I hope you win! Go to my Etsy shop Call Me Cordelia and heart your favorite item! Doing all four of these things will enter your name 4 times for a chance to win the super-duper cute tutu skirt! Make sure to head over to Sew Determined to enter the giveaway! this is adorable~!!! just followed u on twitter!